Blankfein: Trump's Trade Threats Are A Savvy "Negotiating Strategy"
With roughly six months left before he leaves the Goldman Sachs C-Suite, CEO Lloyd Blankfein has been sounding more uninhibited in interviews lately. In one recent conversation, the CEO admitted that "it's only with great trepidation that I'd say anything positive about the president". But he changed his tone in an interview with Bloomberg News Editor-in-Chief John Micklethwait published Tuesday, where the longtime investment banking executive finally found something positive to say about President Trump. As Blankfein argued, Trump's tariff threats "make sense" as a bargaining strategy and probably won't precipitate a devastating trade war or the attendant economic collapse that on Tuesday clinched the Dow's longest losing streak in 15 months. "That’s what you’d do if it was a negotiating position and you wanted to remind your negotiating counterparty of how much firepower you have," Blankfein said Tuesday in an interview at the Economic Club of New York. "I don’t think we’re in a suicide pact on this, so I suspect we’re not going to cause the economies to collapse." Instead, Blankfein speculated that Trump's aggressive trade war threats (the president most recently threatened to expand tariffs to $200 billion of Chinese good) are part of a broader "negotiating strategy." "I do think -- as some people have commented - that this is part of a negotiating pattern, that would be my best take," Blankfein said. Asked about his relationship with the Trump administration, Blankfein shared details about a recent trip to China that Goldman was invited to participate in. Blankfein tagged along in an effort to help close an "important transaction." While he couldn't provide too many details, he explained that the venture - a partnership with China's sovereign wealth fund - was meant to raise money for a fund that would invest in US companies that export goods to China. The deal was "an important symbol of what China wanted to do for US trade," Blankfein said. "There's a lot of frustration with China from here...I know that China is unhappy with the sudden aggressiveness of US policy...but anybody who has transacted with China appreciates the potential of China and has good experiences with China and frustrating experiences in China. We ourselves stop be quite honest 15 years ago almost set up our joint venture in China that seemed imminent at the time...and in fact there were statements that said it's already available...and when it gets to the ministries that have to affect these things..we learned that [the bank] has to be capitalized at a level that would be totally...not sensible for us to do - and so we're back at square one." Following the trade discussion, the conversation turned to the controversy du jour - President Trump's "zero tolerance policy" that has led to migrant children being separated from their parents and detained at the border. Blankfein said the images of crying children were "heart-rendering." "Watching now is heart-rending and I wouldn’t be on that side, but thank God I’m not there - It’s never right against wrong, good against evil," said Blankfein, who noted how immigration debates have roiled Europe. "Now what do you want to do? Both sides are right." 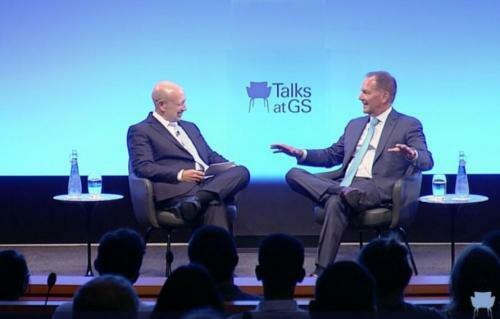 It has been nearly two months since Blankfein tweeted, but yesterday, as we detailed here, Yahoo Finance published an interview that the outgoing Goldman CEO conducted with Paul Tudor Jones. During the interview, Blankfein goaded Jones into offering a pessimistic view of asset prices that mirrored the long-term bearish views of Albert Edwards, perhaps Wall Street's best-known permabear, and also Blankfein's increasingly anxious outlook on markets and the mismanagement of the world's largest central banks.